Want to learn how to ride a stand up paddle board? With each daily or weekly rental, we provide a free 15 minute lesson. Believe it or not, most people are up and paddling on their own in that amount of time! 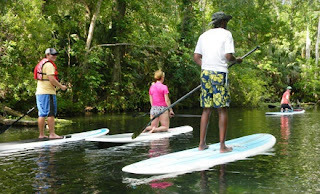 We also provide up to one hour of paddle boarding lessons at a very affordable rate. Plus, we'll deliver your paddle board and pick it up when you're done. Stand up paddleboard rentals are fast-becoming one of the most popular things to do in Gulf Shores and Orange Beach. Consider going on one of our stand-up paddle boarding tours. We'll take you by boat to some of the thousands of bays, inlets and creeks where you can explore and see wildlife (including dolphins) away from heavy waves and boat traffic.